The Avenue of Honour when it was planted in 1918 consisted of 35 trees, and commemorates those who served in World War One. 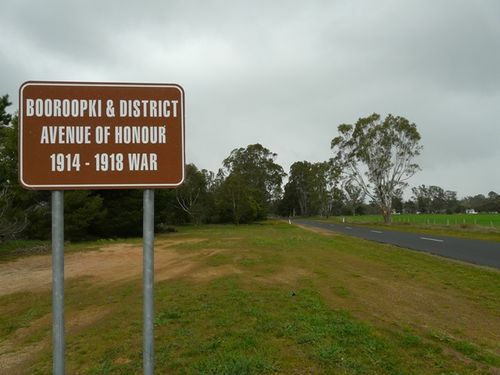 A public meeting was held at Booroopki on Friday, 2nd August 1918 and it was decided to plant an avenue of trees in honour of local and district soldiers. Besides planting of the trees, enamel plates, bearing the soldiers' names and units, were nailed to the guards. The trees were securely enclosed with timber gurads five feet square. Mr. B. C. Ruxton A.M. O.B.E.